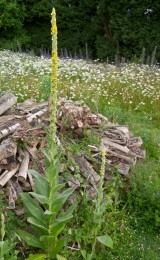 Great mullein, a tall erect biennial covered with white or greyish down and with a spike of bight yellow flowers is unlikely to be mistaken for any other British plant. The only exception is hoary mullein which is locally common in Norfolk and Suffolk but which can be identified by its branched stem. 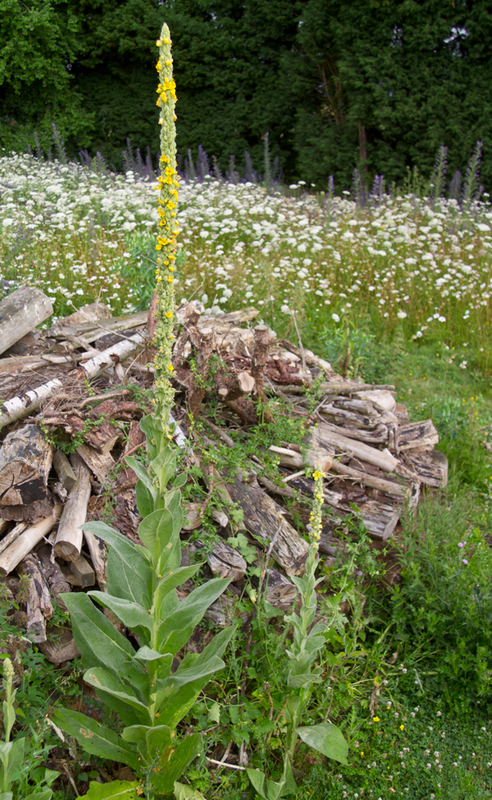 Great mullein, a native biennial, is most frequently found on calcareous, free draining soils in rough grasslands and waste ground. It is dependent upon its long lived seed for regeneration which it produces in prodigious amounts. If, in late summer, you find a sorry looking great mullein striped of all its leaves it is likely to be the work of the larva of the mullein moth (Shargacucullia verbasci). Look out for a large, brightly coloured caterpillar covered in black and yellow dots.